Incivility in politics bothering you? Join us for a discussion on how we discourse. Political discourse in the United States is devolving. From social media to Washington D.C. closed-mindedness, confirmation bias, and rationalization are undermining the possibility for constructive dialogue. 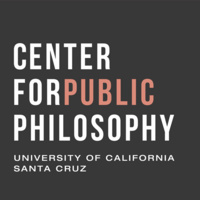 Please join us for a presentation and conversation to learn how the Center for Public Philosophy at UC Santa Cruz is fostering more thoughtful and engaged communities of thinkers, doers, and change-makers by using philosophy to teach us all—especially the next generations—how to think and talk to one another differently. This event is brought to you on behalf of the Center for Public Philosophy, a research center within The Humanities Institute at UC Santa Cruz. Hosted by UC Santa Cruz Alumnus, Joseph Belichick, Kresge, '91.